Home » Commercial Cabinetry » Jump, Jump…Push It To The Limit! 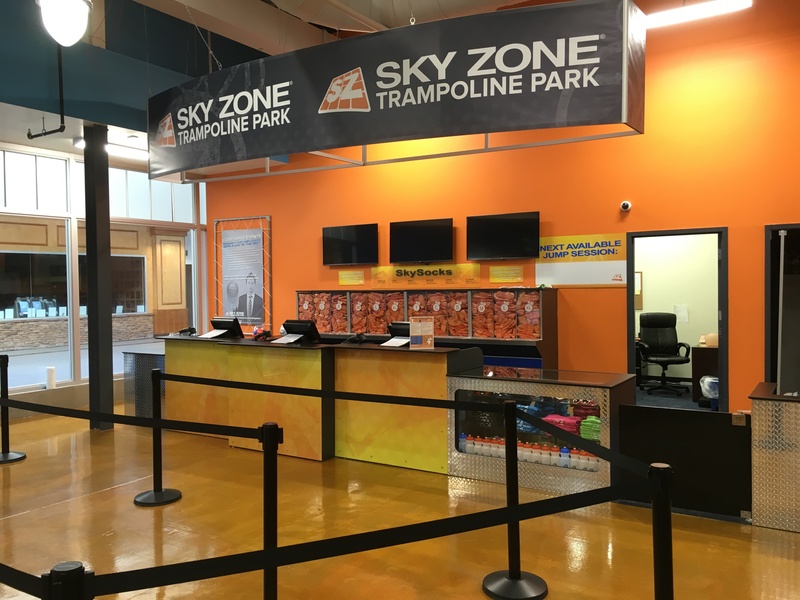 Sky Zone® in Kingston, Massachusetts is a top South Shore destination for all ages fun fitness disguised as family entertainment! Sky Zone® Kingston offers great activities such as Open Jump, a SkySlam basketball dunking court, Ultimate Dodgeball, a Foam Zone, and a Toddler Court for kids walking to 4 years old. We also offer a full schedule of SkyFit classes, Toddler Time, a special abilities low-sensory jump, and more. Creative Surfaces custom built all the interior commercial cabinetry. From the front desk when you walk in, to the waiver station kiosk where you print off your passes, no finish or detail was overlooked. We even created the customized pub tables complete with Sky Zone® branding.